Molly Williams was a ‘sensitive’. She saw things that other children did not, and when her Grandpa came to see her it made her day. The trouble was he’d been dead for a while, and the message he brought was not for her. Holly Palmer fell in love with The Ivy as soon as she saw it – the derelict pub had a history – maybe she should have taken note of it. John Naylor’s future was on the line – join the army or face an inevitable future behind bars. His decision in 1936 was to turn him into a legend with those fighting against the tyranny of the jackboot. Jackie Blane hadn’t always been a dance teacher, and when a surprise discovery in the London borough of Putney brought her face to face with her past, she was thrust suddenly under the spotlight of DCI Dennis Marks. 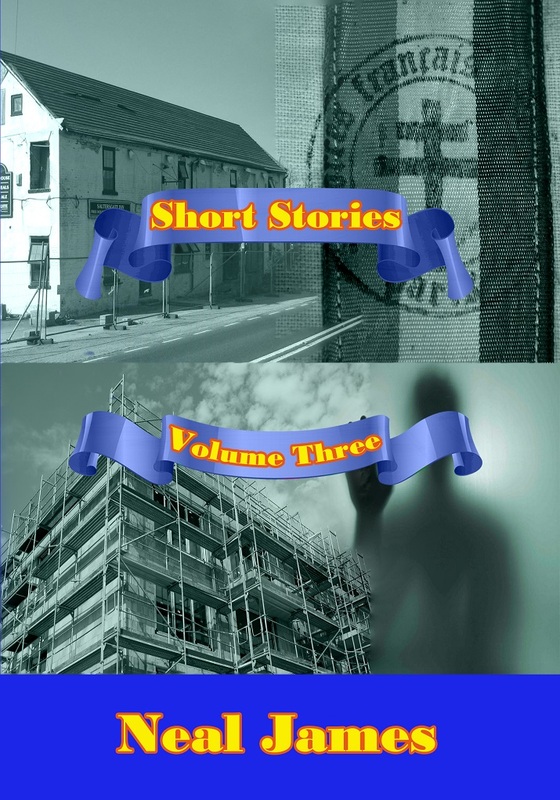 Just four ‘teasers’ to set you on the way in this, Neal James’ third volume of short stories. Like the first two books, you will find yourself down a succession of blind alleys which are Neal’s stock-in-trade. Wendel Morley had never made love before – this would be his very first time, and he was extremely nervous. It was as though his entire existence has been rushing, inexorably, towards this one point in time. His hands were shaking, and he had to make an intensely conscious effort to control himself. Failure at this point was not an option, and his entire public image would rest on the decisions he would make over the course of the next few moments. He looked up and across the space between the two of them. The guy, the object of his attention, stood not eighty feet away across the grass, and was staring directly at him. What indeed; one false move and the whole thing could come crashing down around him. His game plan had been simple - a direct approach followed by some neat interplay. He would, he thought, have been irresistible. He took a deep breath and turned away, briefly. Aware of the murmuring of a crowd of people all around, he swallowed hard and faced forwards once more. It was true. He was here by invitation unlike many of the rest, and his very best was the minimum which would be required if he were to achieve the objective. Staring back across the expanse, he met the guy’s eyes once more. There he stood, almost motionless – six feet four, and twelve stone of sinew and muscle – everything that Wendel had imagined. It was now or never, and an edginess was beginning to creep into to his erstwhile flawless preparation. Wendel took a step forward – the murmuring stopped. He looked around and was now aware that everyone around was looking at him, and him alone. This was it. In an instant it was done – the Rubicon had been crossed, and before he realised it the ball had flown across the seventy-eight feet, a small cloud of chalk dust marking the spot where the ace had landed. A flailing racquet from his opponent across the court being a despairing attempt to retrieve a lost cause. The eruption of cheering almost drowned out the umpire’s voice as he confirmed Wendel’s glorious victory.